Securities offered through LPL Financial, Member FINRA/SIPC. 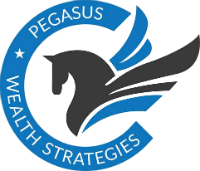 Investment Advice offered through Pegasus Wealth Strategies, Inc., a registered investment advisor and separate entity from LPL Financial. The LPL Financial Registered Representatives associated with this site may only discuss and/or transact securities business with residents of the following states: CO, FL, IL, MI, NC, WI.The information on these pages is not intended to be a substitute for specific individualized tax or legal advice. We suggest that you discuss your specific situation with a qualified tax or legal advisor.